Previously based in Aylesbury and Hemel Hempstead, with a strong local reputation for our professional approach and high standards of workmanship. Mr Field has now moved to Cornwall and is providing garden design, project management and consultancy. 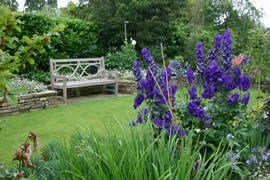 At Robert Field Landscapes, we offer a flexible range of services especially for the domestic garden to suit your needs. We hope you’ll take a few minutes to look through our details and find out more about us and how we can help you get the most from your garden. If you would like to talk to us about your ideas in more detail, contact us by phone or email and we can have a chat or arrange to come and visit at your convenience to do a no obligation quotation. We look forward to hearing from you. "Our aim is to help you use, love and gain hours of pleasure and enjoyment from your garden"